Used to convey an array of information from assistance and warnings to directions and adver­tise­ments, signs surround us every day. Whatever the purpose of the sign, it is important that it is securely fixed to its post, ensuring durability and safety while maintaining maximum effectiveness and visibility. Lots more uses are found for stainless steel banding during the cooler months, from the securing of strict safety warnings to safely attaching rugged outdoor municipal Christmas decorations to street furniture, And how do you think Santa secures all of those Christmas presents on the back of the sleigh? BS Stainless are proud to have developed the Bandfix family of products, the perfect way to secure signs to posts plus lots of other versatile applications. UK-manufactured from grade-201 stainless steel in order to maximise its durability and strength, Bandfix has an innovative safe edge to protect the user when working with the product and offers a complete fastening solution for signs when used with stainless steel buckles. Ideal for outdoor signs thanks to its resistance to the corrosive action of the elements, Bandfix is also used for other general fastening applications across a range of industries. The product is supplied in securely-rolled lengths with width options to suit any intended purpose. To secure Bandfix, stainless steel buckles (also known as ‘ear-lokt’) should be used. 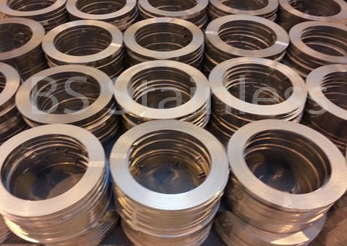 The buckles supplied by BS Stainless can also be used with other types of stainless steel banding and are available in a choice of sizes to suit your needs Bespoke orders are welcome and can easily be arranged with the use of our highly modern machinery. Manufactured from the same grade-201 stainless steel as Bandfix itself, the buckles will continue to provide resistance to the weather. The banding tool is used to bring the two elements together. 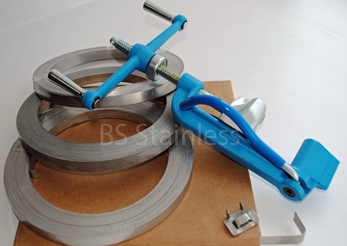 Providing over 2400lb/1100kg of tensile force, the tool strongly wraps the band and secures it with a buckle, conveniently cutting off any spare stainless steel banding in the process. A spring-loaded grip lever and spinning handle makes the Bandfix banding tool easy to use and, thanks to its drop-forged manufacture and epoxy powder coating, the strong and durable tool will itself resist the damaging effects of corrosion. Please contact our team live online, by phone, email or on social media for further information on our selection of stainless steel banding and related accessories such as the tightening tool. BS Stainless are, as always, your partner for stainless steel.